Brian Vike’s interview with the late Jeff Challender. 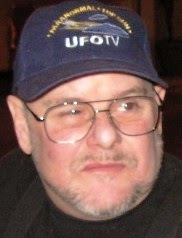 Canadian UFO Investigator Brian Vike’s Note: I have Jeff Challender’s UFO footage on DVD somewhere packed up in a box, I did look, but there is just to much to go through, so I can’t provide the video in this posting. The Late Jeff Challender of Project Prove. Jeff Challender (Project Prove) reports, "on the 12th of May 2004, my wife and her friend were out on front lawn as my 17 year old son got off the school bus. A helicopter flew overhead and when they looked up, an unusual object was also seen that was much higher and further away. My wife called me out and it looked like a silvery Mylar helium balloons. I asked my wife to bring me our camcorder so that I might capture the event on tape. I turned on the camcorder, and aimed in the direction of the object. When I found it in the viewfinder, I zoomed in to 500x, the maximum this camcorder is capable of and the object was bright, and flashing on and off. It was moving east, whilst the wind was SSW, 10 - 15 mph. As the object proceeded east, it became obvious that it would soon pass behind a tree in a neighbor's yard. The tree limbs offered a point of reference to gauge speed and direction with greater accuracy. The stationary tree showed that the object was not only tacking across the wind, but "skipping" side to side, and apparently, up and down as well. I am reminded of Kenneth Arnold's 1947 description of his UFO sighting. He stated that the objects he saw behaved like a "saucer skipping on water". This object behaved in much the same manner, although it never presented any appearance of a saucer shape. Throughout the event, it was a flashing light of varying brightness. In addition, the flashing was uneven. After two minutes of recording, the object disappeared behind a tree, and did not return. We cannot identify it. The witnesses were, myself age 51, my wife Janet age 47, her friend Sharon Springs age 45, and my son Max age 17. We are all willing to swear before almighty God that this statement is a true and accurate account of what we observed with our own eyes. Thanks to Jeff Challender. Thank you to the late Jeff Challender for taking the time with me to do the interview. Jeff ran Project Prove, in which Jeff would go through NASA’s footage of their space missions looking for evidence that NASA was coving up information of UFOs. The audio interview was done with Brian Vike of The Vike Factor.